In a follow up question, my friend asks about easily getting a DVD out - having finished editing the footage in Premiere Pro. First (in Premiere Pro CS4), click on File>Adobe Dynamic Link>Send to Encore. This is one of the nice features of a Suite of software. Each one of the Adobe programs works so well with the others. They've really done a great job on making this happen. When Encore starts, you can accept the defaults, clicking OK on the pop-up menu. Then, click the Build button in the dialog box. In this way, you can send your Premiere Pro timeline out to DVD with minimal fuss. Once the DVD is built, it should simply play when inserted into a standard DVD player. If you are having troubling mastering the menus and titles in Encore, do your titles in Premeiere Pro and use this method to get the project on DVD - saving time and stress. "... I've edited some of my bands footage down to a great video clip, but I couldn't figure out how to simply make a top layer "transparent" when it has another video media running below it ..."
Click on the small triangle on the top-right side of the upper clip. You'll see the flyout menu shown above. Select Opacity>Opacity (making sure that it's checked). Then add a keyframe at the beginning of the effect - where you want the fade to transparent to begin. A keyframe indicator appears within the clip. Pull the yellow line down - decreasing the Opacity of the clip. You can set up a keyframe at the beginning and one at the end - fading in and out of the clip as you like. Opacity is the keyword here - and not Transition. A reader writes in to ask the difference between two settings found in the Camera Raw Preferences dialog in Bridge CS4. What's the difference between Automatically open all supported JPEGs and Tiffs and Automatically open JPEGs / TIFFs with settings? Good question. Automatically open all supported does just that. If the file's been opened in ACR and saved with settings or if the file has never been opened by ACR, the file will open in ACR. Automatically open ... with settings is slightly different. If the file's been opened in ACR and the settings changed / saved, then the next time you choose to open it - up pops ACR. If you've never opened it and changed / saved settings and you chose Open from within Bridge CS4 - up pops Photoshop CS4. 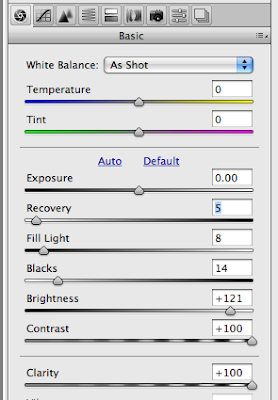 With this setting enabled, you'll need to manually choose to Open in Camera Raw. The extensive guides to metadata standards and best practices, paired with links to other resources, are just what you need to become meta-smart. Coming soon: Step-by-step screencasts and PDF tutorials show how popular software tools make it easy to embed essential metadata in your digital files. "In 1992, a Phoenix man named Ray Krone was convicted of murdering a cocktail waitress named Kim Ancona. The crime was brutal. Ancona had been sexually assaulted, stabbed multiple times, and bitten on her breast and neck. Krone was indicted after a local dentist named John Piakis, who had received all of five days of forensic training, told police and prosecutors that Krone’s crooked teeth created the marks on Ancona’s body. At trial, a more experienced bite-mark analyst from Las Vegas named Ray Rawson confirmed Piakis' findings: The bite marks on Ancona’s neck could only have come from Krone. Rawson included a 39-page report with his testimony. It must have been convincing, because the jury convicted Krone despite no other physical evidence linking him to the crime. He was sentenced to death." The Keywords file has been posted on the secure site is available for download. I'll keep it updated from time to time ... posting a note here on the blog when it happens. 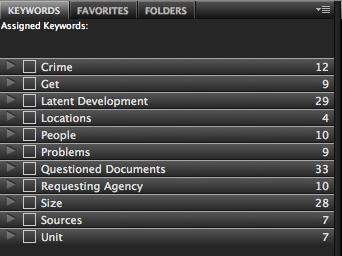 To install the Keywords file, open Bridge CS4 and select the Keywords panel. Click on the flyout menu and select either Import or Clear and Import. 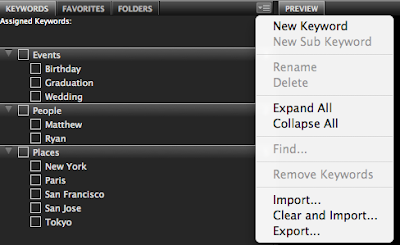 If you already have some custom keywords, select Import. If you still have the default set, go ahead and select Clear and Import to start fresh. Like magic, your keywords will be replaced with the new set. 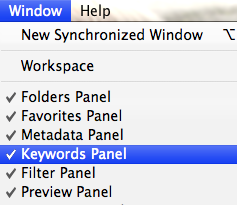 If you can't find the Keywords panel, go to the Window menu and make sure that it's selected. 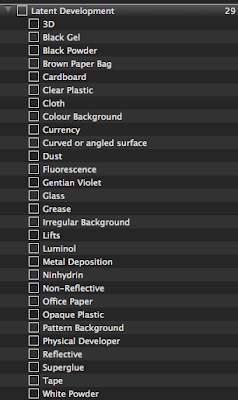 In trying to be as comprehensive as possible, the new Keywords list for Bridge CS4 and Lightroom 2 also includes a section for Questioned Document Examiners. I should have the list up on the secure site tonight. "'Digital' has quickly become the latest buzz word when it comes to audio and video recording. Over the past year, I have had much discussion around digital technology with our law enforcement customers, who are looking to upgrade their interview room systems. Unfortunately, early digital recorders - and even most of today’s brand name recorders - are simply not designed to meet the unique needs of interview rooms. In fact, many early adopters have abandoned their digital upgrades, and are once again dealing with the mile-high stack of VCR tapes. Why? Most DVRs are designed for traditional security applications, devoting much of their digital horsepower to managing multiple video signals, often resulting in poor audio quality and poor audio synchronization. Additionally, security DVRs are designed for passive use by a limited number of users, whereas LE applications demand constant use by sometimes multiple users. To make matters worse, the evidence exported from many DVRs is often not easy to quickly share or play back on PCs. The result - a lack of satisfactory performance for interview rooms and other law enforcement needs, and unhappy customers. Fortunately, a select few DVR manufacturers have addressed these issues – designing products with the law enforcement professional in mind. To help guide you through the mire of literally hundreds of digital video recorders on the market, I have prepared a list of key questions that every LE customer should consider when purchasing a digital video recorder:"
To read Jake's list and his reasoning behind his top ten questions, click here. ed. note: Supercircuits is a regular vendor at the NATIA national show and is a very LE friendly company. Instant messaging can often reap quick rewards. A friend, responding via IM, noted that my Keywords file will also work in Lightroom (although keywords are handled slightly different in Lightroom vs. Bridge). 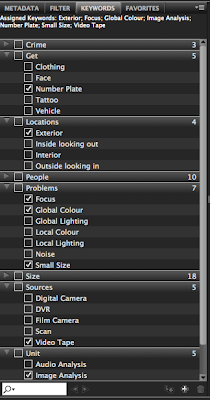 So there's a bonus ... if you are using Bridge and Lightroom then you can load the keyword file into both. Included in the Keyword file is a list of keywords associated with the development of Latent Prints. Regardless of the crazy combination of surfaces and developers that you'll need to come up with to get the prints, you can check the appropriate keywords. The next time that you are asked to put a presentation together on using superglue to develop prints on clear plastic bags, you'll easily find example images to show your audience. Remember, the Keyword file will be uploaded to the book's secure web site in the next few days. It's free, and it's my way of saying thanks for supporting my efforts here. 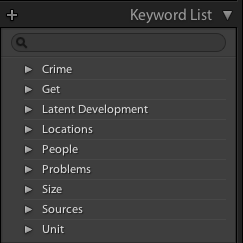 I was giving a lecture recently and one observant member of the audience noticed that my Keywords panel in Bridge CS4 looked remarkably different than his. I've created my own keywords and hierarchy ... one that seems to make sense for what we analysts do. I can tag based on crime type, what I'm asked to get, who's in the picture, the location of the camera, the picture's problems, the source, where it's going, and so forth. It's helpful in sorting through vast quantities of work looking for images of number plates taken from interior cameras that look out to the street and so forth. It's also a quick way to build a "six pack" line up card, as I can keyword for image size and people. As it seemed popular, once it was explained what I'd done, I'll post the keyword file to the book's secure web site in the next few days. Owners of the book will be able to download it for free (membership has its privileges). "An Orleans Parish judge has ordered Michael Dell, the chairman and chief executive of computer giant Dell Inc., to give sworn testimony in person about his company's ill-fated crime-camera deal with the city of New Orleans. Also Monday, Dell's attorney acknowledged a 2004 meeting between Dell and Mayor Ray Nagin, whose connection to Dell's partner in the camera project, NetMethods, is being investigated by the FBI. Several times since it came to light that NetMethods paid for lavish trips for Nagin, the mayor has said he doesn't remember meeting with Dell, though his 2004 calendar showed a scheduled meeting ..."
"It has become one of the staples of modern, hi-tech life: using satellite navigation tools built into your car or mobile phone to find your way from A to B. But experts have warned that the system may be close to breakdown. The satellites are overseen by the US Air Force, which has maintained the GPS network since the early 1990s. According to a study by the US government accountability office (GAO), mismanagement and a lack of investment means that some of the crucial GPS satellites could begin to fail as early as next year ..."
ed. note: if we are including GPS data in our metadata, and that data becomes unreliable ... what then? Only time, and the market, will tell. I received an interesting e-mail about repeatability and ACR that I thought I'd share, removing the name to protect the innocent. The issue concerns the rendering engines in Lightroom and ACR and how they differ from version to version. The concern was the lack of repeatability across versions. According to Peter Krough, author of the DAM Book (if you don't already have it, go get it ... it's a great book), Lightroom 1 was developed on ACR 4 whist Lightroom 2 is powered by the ACR 5 engine. The problems come into play when trying to view changes made by newer versions on older software ... like trying to repeat things done in ACR 5 with ACR 4. Some functions will work and some won't. Some will repeat the results exactly and some won't. When performing our kind of work, it's important to list the equipment and software used, including version and/or build numbers. In this way, others can create the same scenario that exists in your lab before attempting to repeat your results. Keep the questions coming. And, as always ... thanks for reading. 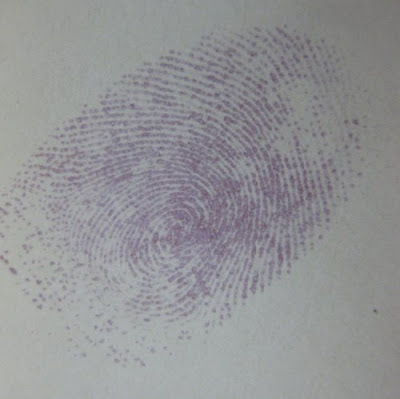 What's the best tool for the enhancement of latent prints? Ask this question in a room full of examiners and you'll likely get 10 different answers. So, let's modify the question slightly. What's the best tool that costs less than $1000? Someone will invariably pop-up with the "what's the definition of 'best'?" Fair enough. An imaging colleague of mine once defined "best" in this sense as the least amount of steps (or quickest) way to a binary image (black and white). Fastest to a binary and under $1000? Let's say that you've received, as I did, a poorly shot image of a latent print. It's dark and the focus is a bit off. From Bridge CS4, right click on the image's thumbnail and select Open in Camera Raw. From there, head straight to the HSL / Grayscale tab (4th from the left - the zig-zag lines). 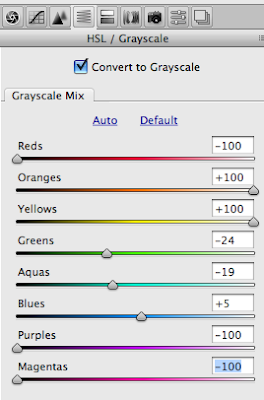 Check the Convert to Grayscale box. Here's where the fun begins. In looking at the image, there seems to be an abundance of red, purple, and magenta in the print's colour. We can enhance this by sliding the applicable sliders all the way to the left, as seen below. Then, we can lighten (or desaturate) the paper by sliding the Orange and Yellow sliders all the way to the right. Next, move to the basic tab. Move Clarity and Contrast all the way to the right (maximum) and Brightness almost all the way to the right. ACR updates the preview as you do this, providing instant feedback on your results. Then, move the Blacks and Recovery sliders slightly, adding back any lost ridge detail. From here, you simply select Save Image, choosing the appropriate save options and destination location. Or, you can choose to move the image into Photoshop for further clarification. Start to finish - just a few steps. It took less than 2 minutes to process this image. Next time you are stumped trying to get a colour out of an image to get to a print - try working it in ACR 5. I think you'll see for yourself just how easy it can be. I got a note from a reader asking, "I heard the term Parametric Image Editing in a seminar the other day. Just what the heck is it?" In Parametric Image Editing (PIE) (a type of non-destructive image editing), the software doesn't change the original files. Changes to images are recorded as sets of instructions (parameters). If you are using Lightroom or ACR to edit images, then you are engaging in PIE. If you would like more info on the subject, check out this technical paper on Adobe's site written by Peter Krough (author of the DAM Book - Digital Asset Management for Photographers). Over the course of an investigator's career, he/she may amass thousands, if not tens of thousands of images relating to cases across all sorts of crimes. Tying these cases together has been a frustrating and expensive task - so much so that many departments have yet to go completely digital. But some new software offers a glimpse at the future. It's called iPhoto '09. I've received numerous e-mails and calls about iPhoto's newest version, so I thought I'd address the feature that's got the cop world buzzing ... Faces and Places. Other image management programs allow for the grouping of files. Just drag them to folders, label, sort, and etc. iPhoto goes a step further ... it does the grouping automatically using image / facial recognition. And, while it's not perfect ... it's pretty good. Good enough to get people talking. The Faces portion of Faces and Places analyzes at the images on your hard drive by examining the unique characteristics of each face in the photo - eyes, mouth, hair, nose, and etc. - and puts similar faces into groups. No need to worry about configuration options or which buttons to push ... iPhoto will attempt this process when you first start the program. At this point, you just open the program and wait for it to sort through your hard drive. If you are like me, and have GB's of images, this initial scan will take some time. Not to worry, however. You can run the scan in the background and continue to poke around the interface (who reads the manual?). ... and speaking of manuals ... there is none. iPhoto 09 comes as part of iLife 09. The $79 suite only ships with a small getting started guide. No detailed manuals ship with the installation DVD. So, is there a manual or not? Well, there is ... sort of. There's a couple that you might want to run out and pick up, or download from O'Reilly. The first is iPhoto 09 - the Missing Manual. True to the name and the concept of the Missing Manual series, the iPhoto 09 Missing Manual delivers all of the valuable information that you'll need to get the most out of this very interesting addition to Apple's software offering. LE users will appreciate the depth of chapters 4 and 13, dealing with Faces and Places and File Management respectively. Also included in iLife 09 are updated versions of iMovie, iDVD, iWeb, and Garage Band. But remember, no manual for these either. (Don't worry, I've got you covered here too) iMovie 09 and iDVD - the Missing Manual is the place to go to learn how to import video, build your movie, add a few effects, stabilise, fix colour, add photos, and export your movie to YouTube, your boss' iPod, or elsewhere. I think that the Missing Manual series was conceived with LE in mind - the books offer easy to understand and well organised instruction without all of the techno-jargon usually found in user manuals. ... back to iPhoto 09 ... the algorithm is certainly not as powerful as the stuff the big agencies are using, so it's bound to miss a few faces on the first pass. You can fix these manually with the Add Missing Face button. The people that are tagged will then be placed on the cork board. While iPhoto's editing skills are not quite ready for prime time (stick to Photoshop for LE - please), Faces and Places adds a useful tool to the investigator's tool chest. Good old Ninhydrin. The CSI shows love it, and all of the other alternative light source / chemical processing tools. They make for good drama. Processing them in Photoshop used to be a bit of a chore. Now, there's several ways to get a good binary image. Now that we can use Adobe Camera Raw to develop JPEGs and TIFFs, we can use ACR to begin the work on chemically processed latents. Here are some quick/dirty settings suggestions for ACR. Dump the Saturation all the way down and the Contrast all the way up. You can also pump up the Clarity slider as well. Blacks can be set from 20-50 depending on the strength of the chemical's signature in the image. In our case, I've chosen 40. Once you move the image into Photoshop CS4 - load the Forensic Photoshop Configurator Panel and begin your work. 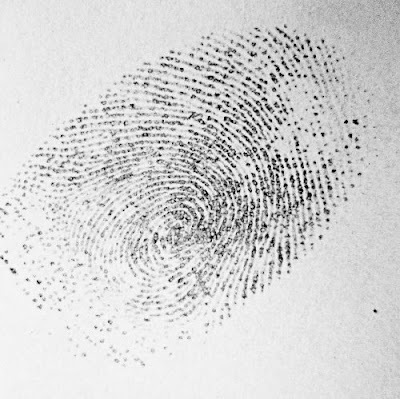 With the Forensic Photoshop Workflow applied, these prints now display their detail in stunning clarity - clarity that's essential for both the analysis and for courtroom presentation. So many images that are sent to me have such rich detail trapped within them ... just waiting to be set free. 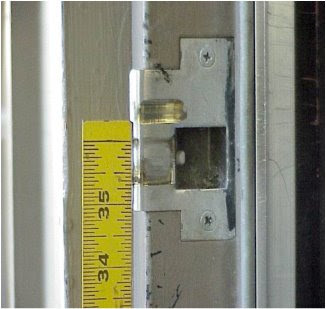 Take this image from a crime scene. The photographer was focusing on the tool marks - but the focus and colour is just a bit off. I've uploaded the Forensic Photoshop Configurator panel to help with images like these. Just work down the panel to address focus, colour and light, sharpness, and so forth. 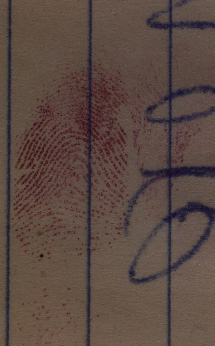 In just a few minutes, you can work through the image - clarifying it and making it ready for your investigation. 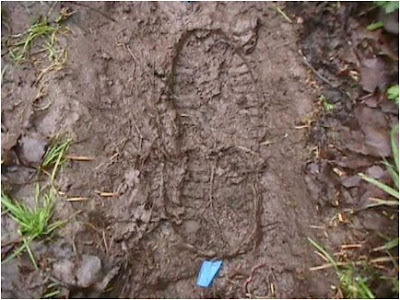 The same is true for shoe prints. In the case below, there's a bit of a cast caused by the reflection from the muddy ground as well as a softness to the focus. All easily addressed with the Configurator panel. Now, these are just low-res versions of the originals. Yours will look so much better. Best of all, the CS4 Configurator Panel comes free with your purchase of Forensic Photoshop - just download it from the web site. Of the ten Silver Stars awarded for the battle of Shok Valley, nine were earned by Special Forces soldiers. The tenth was awarded to a combat cameraman. On Dec. 12, 2008 Spc. Michael Carter, Combat Documentation & Production Specialist 55th Signal Company (Combat Camera) was awarded the Silver Star for actions in the Shok Valley of Nuristan Province, Afghanistan April 6, 2008. Spc. Carter was one of 10 Soldiers awarded Silver Stars for that engagement, but unlike the Soldiers of Operational Detachment A (ODA) 3336 on the raid, Spc. Carter is a Combat Cameraman. During the hour-long mountainside battle, Spc. Carter charged forward while laying down suppressive fire to recover a wounded Soldier, then alternated between providing first aid and repulsing the enemy. He again exposed himself to enemy fire when he ran across open ground to recover a satellite phone. He assisted the ODA commander with calling for and directing close air support, and assisted the team medic in providing first aid to two more wounded Soldiers. When the enemy closed to within 40 feet, Spc. Carter stood his ground and laid suppressive fire to block the advance. With danger-close airstrikes landing less than 100 meters away, Spc. Carter used his body to shield casualties from falling debris, and assisted in a daring rescue down a nearly vertical 60-foot cliff. Find out more on the BlackFive blog by clicking here. "Over the years, much has been written about the deployment of CCTV as a high tech. crime reduction tool, and yet many experienced practitioners feel that it's effectiveness in this role, has for a variety of reasons, long been overstated. One man who knows more than most about the operational challenges of making CCTV work, is Detective Chief Inspector Mick Neville, of London's Metropolitan Police Service, specialist VIIDO unit – (pronounced like “Fido”). Here he explains in some detail the work of his officers, and describes the challenges and frustrations involved in locating and extracting key usable CCTV material, and presenting it as evidentially admissible recordings ..."
Read more from Doktor Jon's Special Report by clicking here. "... Camera boosters insist that cameras reduce crime. Any city that has had CCTV in place for a while can show off a highlight reel of local perps caught on camera, sometimes in quite dramatic situations. 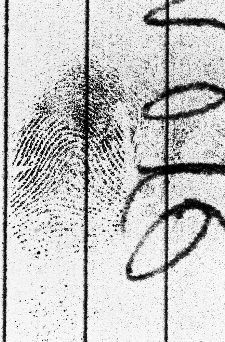 But while anecdotes of crimes solved and averted are plentiful, many researchers say the record doesn't add up to a compelling case. Recently, professors Brandon Walsh, of the University of Massachusetts, Lowell, and David Farrington of the UK-based Institute of Criminology, surveyed the research on CCTV and came away underwhelmed. They found that the presence of cameras is associated with mild declines in crime—particularly in the UK—but that video surveillance is strikingly effective at only one thing: protecting cars from vandalism in parking lots. A recent study of cameras at 19 sites in San Francisco found that the presence of cameras reduced property crime committed within 100 feet of the cameras—but were ineffective at greater distances and had no effect on violent crime. As the use of CCTV expands and evolves, however, cities are using cameras in strikingly disparate ways that are bound to yield different results. Many police departments rely on cameras primarily for their value as a deterrent, leaving them unwatched most of the time and pulling the hard drive to aid investigations only after an incident has occurred. The city of Washington, D.C., uses them mostly for special events, and deploys cameras only sparingly in neighborhoods because of privacy concerns ..."
"... Baltimore's use of CCTV represents still another approach. The stealthy live monitoring that goes on at Citiwatch supplies street cops with a constant stream of real-time intelligence. As Commissioner Bealefeld puts it, Baltimore has made its cameras into "a proactive crime-fighting tool." At least one independent assessment agrees. According to a forthcoming evaluation by the Urban Institute—the first rigorous study to compare CCTV deployment in multiple American cities—crime in downtown Baltimore has dropped by 24 percent since the cameras went in. Moreover, researchers found no evidence that crime was merely being displaced to other parts of the city. "The [Baltimore] police figured out that cameras on their own don't prevent crime, people do," (emphasis added) says Nancy La Vigne, a senior researcher at the Urban Institute. Instead of treating the technology as a crime-fighting tool all its own, Baltimore has moved aggressively to integrate CCTV into its conventional operations. In particular, says Bealefeld, the department has used the cameras to target robberies and "bad guys with guns." ..."
For many in this line of work, the first subpoena received often sends a chill up the spine. "Did I do everything right?" "Did I remember to turn over everything for discovery?" "What kind of questions will I get on the stand under cross?" A previously reviewed book can help prepare the new witness for the first trial. I received some questions about note taking and the discovery process, so I thought I'd point the book out as a reference again. Evidence and discovery rules vary from state to state. The Federal Rules, however, can provide a solid guide and a starting point in discussing the case with your legal team. "The law, however, expects expert witnesses to write reports for the court, outlining their opinions on the matters about which they are testifying. In the eyes of the law, the expert's testimony is allowed by the court only to the extent that the expert adequately documents the basis for it in a report and makes it available to the opposing party before the trial. They go on to mention, "As is the case with much of the Federal Code, Rule 26 has been amended to include provisions dealing with electronic evidence discovery." testimony. Here is what the rule says on that topic. In addition to the disclosures required by paragraph (1), a party shall disclose to other parties the identity of any person who may be used at trial to present evidence under Rules 702, 703, or 705 of the Federal Rules of Evidence. Except as otherwise stipulated or directed by the court, this disclosure shall, with respect to a witness who is retained or specially employed to provide expert testimony in the case or whose duties as an employee of the party regularly involve giving expert testimony, be accompanied by a written report prepared and signed by the witness. The report shall contain a complete statement of all opinions to be expressed and the basis and reasons therefore; the data or other information considered by the witness in forming the opinions; any exhibits to be used as a summary of or support for the opinions; the qualifications of the witness, including a list of all publications authored by the witness within the preceding ten years; the compensation to be paid for the study and testimony; and a listing of any other cases in which the witness has testified as an expert at trial or by deposition within the preceding four years. Federal Rules of Civil Procedure, Rule 26(a)(2). You see the emphasis made on turning over everything in discovery. Notes, reports, and your complete CV. In the world of e-discovery ... this also means notes and reports generated by the programs that we use - if any are created. This means the History Log, in Photoshop, is more than likely discoverable. It's a record of the steps Photoshop has taken on an image or series of images. Smith and Bace make clear the fact that the reports we generate will provide fodder for cross examination. This includes the History Log. If your log is not handled correctly, it will likely include a running list of every image ever processed by you on your computer. Do you want to turn this list over for discovery? Imagine the questions it would generate. If your Log only shows work on a few images, but hundreds were turned in for discovery, you should expect a long series of questions. How do you handle the use of the History Log? Have you consulted with your Risk Management team, your attorneys, or your agency's manual? Before you turn on that function ... check to see if you are OK.